On April 15 Notre Dame Cathedral in Paris experienced a catastrophic fire. The images of flames shooting through the roof and the collapse of the cathedral central spire were horrifying to see. People reacted to the fire in many ways. Those who worshipped at the cathedral or shared the faith of those worshippers could only pray as they watched their beloved church consumed in fire and smoke. Historians grieved over the massive damage occurring at a world heritage site. 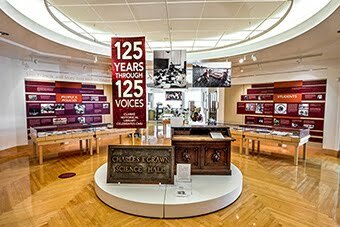 Those of us in special collections libraries saw the fire through our own lens. Medieval cathedrals such as Notre Dame were both grand architectural statements and carefully crafted instructional books. The beautiful stained glass windows were not only a form of worship, prayer expressed in color and glass, but also illustrated important religious scenes for a largely illiterate worshiping community. A sixteenth century worshipper inside Notre Dame might not be able to read the Bible, might not understand the Latin spoken by the priest celebrating the mass, but by glancing up to the light, much of the faith’s most important teachings were there to be seen. As Notre Dame burned, a century’s old tutorial work in the Catholic faith made of glass and stone was suddenly at risk. The fire was a tragic reminder for keepers of history, archivists and rare book librarians in particular, that the collections whose safety they are responsible for are a fragile heritage subject not only to subtle decay but sudden calamity. Unlike a medieval cathedral, a modern storage facility for rare books and archives such as the Clarke Historical Library has fire walls, smoke alarms, fire suppression systems installed and ready to operate, and many other tools to protect the material. If the worst still happens a disaster plan outlines salvage procedures and priorities. The library has installed precautionary technology and written solid emergency plans, but like any human effort, they are not foolproof. 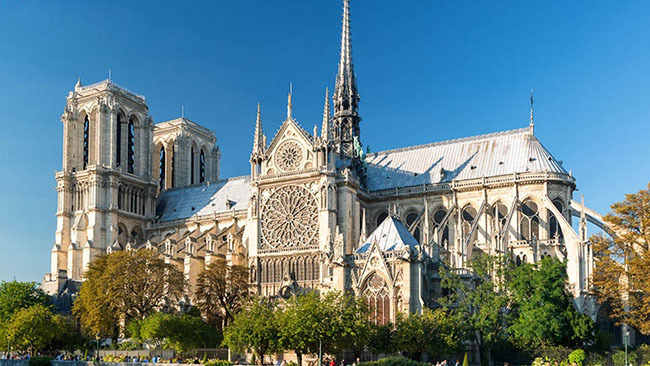 As the fire at Notre Dame starkly illustrated, tragedy can suddenly overcome the physical media that carries our history, whether it exists on paper or is enshrined in glass and stone. The physical “stuff” of history is fragile. Paper and vellum, light sensitive material used to create visual images, the bits and bytes through which computers store data, are all prone to long-term failure and sudden catastrophe. Preserving these media from destruction is one of the core objectives of the archival profession. We offer our deepest sympathy to the community of worshippers who called Notre Dame their spiritual home, to the people of Paris for whom the building was a central feature, and to the global community who have seen a world heritage site suffer grievously. We hope that all these people and others will unite to preserve those parts of the building that remain and rebuild those parts which have been lost. It is how I like to believe people like archivists, and historians, and those who cherish the past respond, whenever a cultural disaster strikes.